Famous for his satirical prints on 19th-century French political life, Honoré Daumier (1808-1879) is the subject of a retrospective at the Royal Academy, which focuses not only on the artist’s well-known political caricatures but also his powerful observational paintings and drawings of working life in Paris. Daumier’s dedicated, public engagement with French Revolutionary ideals of social justice can be clearly observed from the multitude of bitingly humorous political lithographs that fill this show. A notably direct example is Gargantua (1831), Daumier’s caricature of King Louis-Philippe as a lazy, over-inflated monster, consuming money extorted from the poor, an image that resulted in six months’ imprisonment for Daumier under the rigid censorship laws of the July Monarchy. But it is in Daumier’s paintings and drawings of Parisian working-class life that his true talents as an artist come to light. Few works of art have better captured anguish than Daumier’s Expressive Head (1848-52), an exquisite ink drawing in which every line and shadow on the subject’s face suggests a desperate plea for mercy. 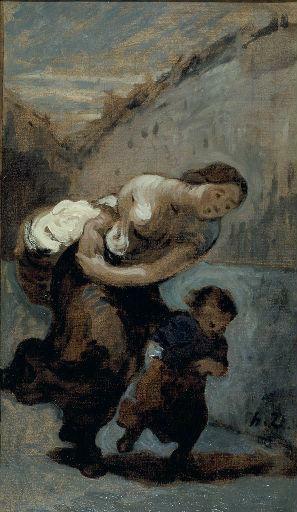 Daumier’s series of paintings called The Burden (c. 1850), taken from the artist’s observations of life along the river Seine, repeatedly depicts a working woman, accompanied by children, carrying bundles of laundry in various locations around the city, evoking a sense of endless haste and toil. In The Third Class Railway Carriage (1862-64), Daumier earnestly depicts the hardiness and delicacy of the poor in cramped, dank conditions, further evidence of his sympathy with the daily struggles of ordinary Parisians. Never a wealthy man himself, having passed up lucrative opportunities in favour of pursuing his interests in political satire and observational art, Daumier has remained famous primarily as a caricaturist. As the first UK exhibition in fifty years to show the highlights of Daumier’s entire artistic output, Visions of Paris will no doubt go some way to furthering Daumier’s reputation as an important figure of French 19th-century art. Daumier: Visions of Paris is open until 26 January.